The game consists in reaching the exit withthehighest score, paying attention to the obstacles encounteredalongthe way. We proceed by sliding the ball on Convas that, thanks totheinternal sensor of the phone, it swings and moves to thedesiredposition. Be careful: the ball must not touch the bars and theobstaclespositioned along the path. These, in the higher levels,can move,creating further difficulties to the player. The levels are expected at this early stage 5. Providedadditionallevels in the future. Every time the ball touches an alien does acquire points that gotoincrease the score. 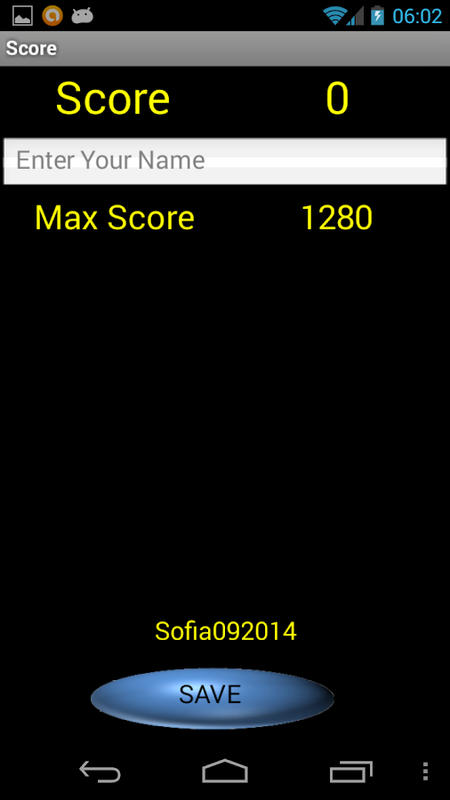 The score is updated only if the reservation is canceled afterthemaximum score is acquired. The recording takes place on theweb.Together with the score is also updated the name of the playerwiththe highest score. The passage level will be activated when you reach aminimumscore. In fact it's all very simple, just take action that everythingiseasy. There are 5 levels. Each one graphically different from the others.The game is to grab the bat and drag it without dropping the balldown. Whenever the bat touches the ball you gain points. The moretime passes the more the speed of the ball increases. When the ballreturns to its initial value, the Bat size reduces. The transitionlevel will come automatically only when you reach the maximum scorefixed for each game. it's really simple, just take action andeverything will come easily. The fun is guaranteed! It happens to everyone to have different passwords to manage andhaving to waste time to remember where to look. Typically writtenon a file unprotected or worse on a sheet of paper. This app is asafe and easy way to manage your passwords, whether it be aone-stop Internet site cash machine. Passwords are encrypted,stored and saved on your phone or tablet. Access is via a singlemaster password to remember. The functions provided are the Rescue,Search and complete list of the Account. The game is to acquire the highest score in 60 seconds. The pointsare obtained by the bees disappear with a simple touch of thefinger. Be careful not to burst the balloons, you lose points!Thescore obtained is stored on a common database. From the list showswho made the highest score and who wore the crown of Champion. Il gioco consiste nell'acquisire ilmassimopunteggio in 60 secondi. I punti si ottengono facendoscoppiarel'orsetto rosso, l'alieno verde e quello giallo con unsemplicetocco del dito. Attenzione a non far scoppiare ipalloncini, siperdono punti!Il punteggio acquisito viene salvato su un database comune.Dallalista si evince chi ha effettuato il massimo di punteggio echi haindossato la corona di Champion.The game is to acquirethehighest score in 60 seconds. The points are obtained by blowingupthe bear red, green and yellow alien with a simple touch ofthefinger. Be careful not to burst the balloons, youlosepoints!The score obtained is stored on a common database. From thelistshows who made the highest score and who wore the crownofChampion. 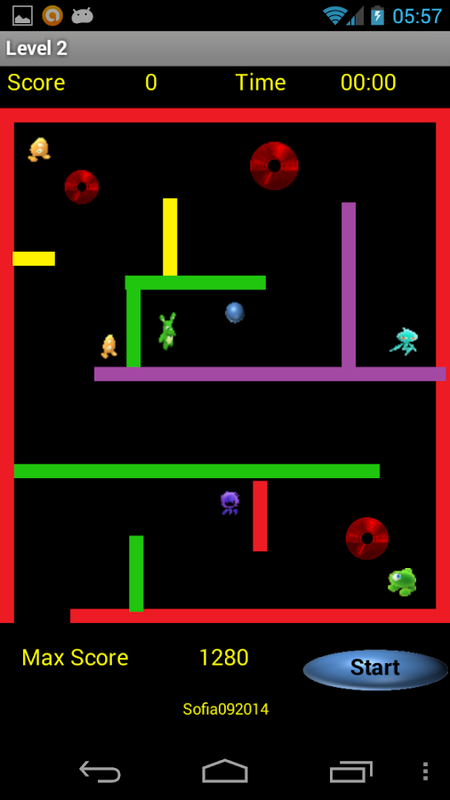 The game consists in the search forAliens,running the ball on Convas, through which the internalsensor ofthe phone, the swings and the door to the desiredposition.Beware though, the ball must not touch the bars. These, inthehigher levels, move and stretch with the flukes of the time,thencreate further difficulties to the player.The levels are expected at this early stage 5. Providedadditionallevels in the future.Every time the ball touches an alien does acquire points that gotoincrease the score.The score is updated only if the reservation is canceled afterthemaximum score is acquired. The recording takes place on theweb.Together with the score is also updated the name of the playerwiththe highest score.The passage level will be activated when you reach aminimumscore.In fact it's all very simple, just take action that everythingiseasy.The fun is guaranteed! The game takes place in two different scenarios. The development ofthe game is quite similar.Before you select the scenario you needto choose the bonus with which to operate.Once you have chosen thescenario you select the bet. Pressing the Play button the wheelsbegin to turn and stop only when you press Stop. At this point youlook at the result: in the scenario of the masks you count how manydaisies in horizontal row highlighted in yellow totaled moredaisies are obtained, the higher the score. There is thepossibility of playing the Joker (crown) when daisies are three. Inthis case pressing Jolly if the crown is positioned over the threedaisies makes thread and you get maximum points, otherwise there isthe possibility of output of the Devil in place of one of threedaisies. In this case, you will lose points.In scenario Theatregameplay and identical but is not expected key Jolly.La chances ofwinning increases because J winners can be found in the centralpositions horizontal, vertical and diagonal central. The yellowframes identify J Winning,Good fun! 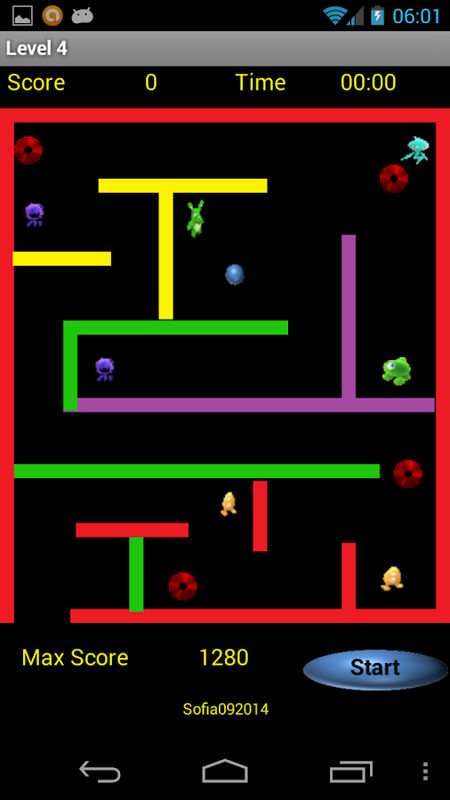 The game consists in reaching the exit withthehighest score, paying attention to the obstacles encounteredalongthe way.We proceed by sliding the ball on Convas that, thanks totheinternal sensor of the phone, it swings and moves to thedesiredposition.Be careful: the ball must not touch the bars and theobstaclespositioned along the path. 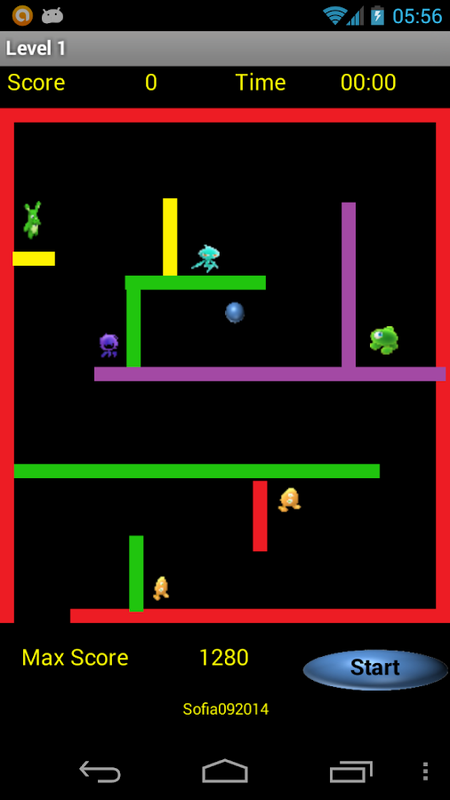 These, in the higher levels,can move,creating further difficulties to the player.The levels are expected at this early stage 5. Providedadditionallevels in the future.Every time the ball touches an alien does acquire points that gotoincrease the score.The score is updated only if the reservation is canceled afterthemaximum score is acquired. The recording takes place on theweb.Together with the score is also updated the name of the playerwiththe highest score.The passage level will be activated when you reach aminimumscore.In fact it's all very simple, just take action that everythingiseasy.The fun is guaranteed!